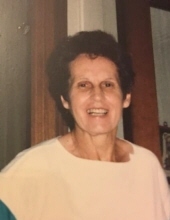 Betty Lee Erickson, 96, died peacefully on Friday, February 8, 2019 of natural causes at Ramsey Village Assisted Living Facility in Des Moines, Iowa. Visitation will be Saturday, February 16, at 10:00 at Soderstrum Funeral Home, 618 Lafayette, Story City, Iowa followed by an 11:00 service. Burial will be at Mount Olive Cemetery in Randall, Iowa. Betty was born October 23, 1922 to Perry Denver Ayers and Sylvia Mildred (Ward) Ayers in Webster City, Iowa. She attended school in Jewel, Iowa, and upon graduation earned her RN degree in nursing at Iowa Methodist Hospital in Des Moines. Betty married 2nd lieutenant James Albert Chaffee who was killed in action in Okinawa in 1945. On April 12, 1947 Betty married Lt. Colonel Quentin Martin Erickson in St. Louis, Missouri. Betty and Quentin settled in Randall, Iowa, where Quentin ran the family farm with his father. Betty began her nursing career in Story City, Iowa. Betty and Quentin had two children. The family moved to Quincy, Illinois for a year before making Dallas, Texas their home. Betty worked as the ER nurse at Doctor’s Hospital, making many lifelong friends along the way. 1973 brought Betty’s family back to Des Moines where Betty continued her nursing career where it had begun-Iowa Methodist Hospital. Betty enjoyed Her Norwegian Rosemaling classes and cross stitching projects. She did beautiful work and family members have her art displayed in their homes. Betty was a care giver to many, including her mother-in-law, mother, and husband. Those left to honor Betty’s memory are her children, David Erickson of Des Moines, IA, and Linda (John) Swenson of San Antonio, TX. She leaves behind grandchildren Brian Gosch of San Antonio, TX, and Nicolas and Benjamin Erickson of Des Moines, IA. Betty was close to her brother’s three daughters : Tamara(Bob) Kuhn and children Mike and Tim, Denise(Mike)Olson and daughter Lisa(Eric) Weichmann and their children Michael, Ella, and Sylvia, and Anita(John) Goodrich and children Joe, Andrew, and Jeff and families. She is survived by her sister-in-law Helen Erickson, 5 nephews and 1 niece and families. Betty is preceded in death by her husband, Quentin, parents Perry and Sylvia Ayers, and brother and sister-in-law Robert and Patricia Ayers. To send flowers or a remembrance gift to the family of Betty Lee Erickson, please visit our Tribute Store. "Email Address" would like to share the life celebration of Betty Lee Erickson. Click on the "link" to go to share a favorite memory or leave a condolence message for the family.